...this makes me incredibly happy! 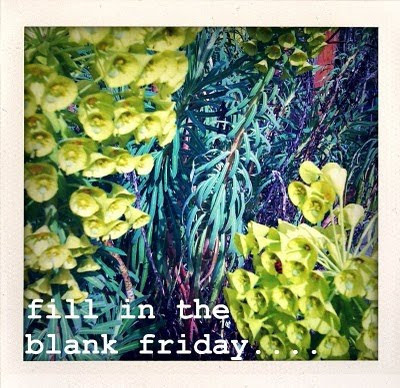 It feels like ages since I blogged on a Friday, so here is a bumber edition of Lauren's fill in the blanks Friday from both this week and last week, hurray! 1. The first thing I do in the morning is hug Thomas and then go back to sleep whilst he gets up and potters around – I’m rubbish at getting up in the morning, I stay in bed as long as I can get away with. 3. My favorite thing to do when I'm having a bad day is cook. I’ve really started to enjoy cooking all of our food from scratch and its so therapeutic as well. 5. Social situations are my favourite, I’ve never been shy and I love to meet new people and chat. 6. I like to collect cameras… hurray! 7. Weekends are for relaxing – at least this weekend will be, I’m determined! 1. The strangest thing I've ever eaten was um, I don’t know to be honest... 2011 edit: Snail! Snail is strange. 2. My best friend is friends are my favourite people in the world – I’d be totally lost without them. 3. If I could live in a different era it would be the future because I’m excited about the possibilities, I obviously watched far too much star trek when I was little! 5. If you only know one thing about me it should be I’m overly emotional when it comes to people and things I love. 6. My favorite book of all time is The Pawn of Propehercy by David Eddings – it opened my eyes to a science fiction and fantasy world and I haven’t looked back since. 7. The one beauty product I couldn't live without is concealer. 8. Blogging is my favourite pastime, its my little haven where I have the greatest blog friends, so much creative inspiration and I love it. Especially now my reader is organised and I can keep up with all your amazing blogs – I’m comment happy, hurray! 9. If I could star in a movie with any actor/actress I would want to work with Elizabeth Taylor when she was younger… she was absolutely stunning and had such presense. 10. One of the best feelings in the world is being happy with yourself… its such a tough place to reach and I don’t feel it everyday but when I do, it’s the best. and just to complete my Friday here are some fabulous links that I've been saving up! 1. After yesterday's tape excitement I am loving all tape inspiration! 2. After yesterday's polaroid excitement, I am loving all polaroid's too! 4. The only 'Keep Calm and...' poster I have ever really really wanted... I love it. 5. Some amazing 'things I love about spring' lists from Miss James and Janel. 6. Some amazing yellow love sent to me by Cassie. Thanks Cassie, you made my day!! Happy Friday! Have a wonderful weekend! p.s. if anyone else sees any yellow links that I may have missed send them my way, I love them!